Absolute Adventure offers a number of offroad cycling trips in both the UAE and Oman. Try our thrilling Downhill Dash in Wadi Khab al Shamsi if you're a confident cyclist or, take a scenic ride through Wadi Helo and discover ancient settlements and srtifacts from the Bronze and Iron Age. Whether you're looking for a physical challenge or a cultural tour, we've got a cycling trip that fits your needs! 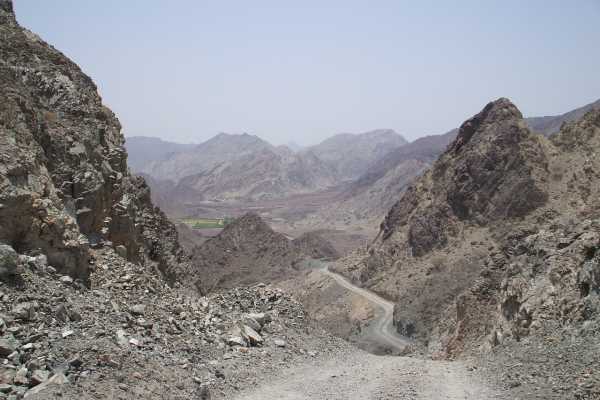 From AED 519.75 An exhilirating down hill mountain bike route through Wadi Khab al Shamsi in Dibba, Oman. Starting from our Adventure Centre, we'll transport guests and bikes about 1 hour up the wadi to the starting point of the cycle. From here it's a high speed dash down the wadi road, stopping at scenic points and appreciating the natural beauty of the mountains. This cycle requires confident off road cycling skills. From AED 456.75 This gentle offroad cycle visits a number of cultural and historical sites in scenic Wadi Helo. In the mountains above Kalba we begin our cycle by peddling towards an ancient petroglyph site. There are several preislamic petroglyph sites along the trail. Next stop is the restored fort and watchtower. These well restored building give a glimpse into the past and the old way of life in this region. You'll then have a long mostly downhill cycle from Wadi Helo back to our camp in Kalba. From here you're welcome to join our sunset paddle in the mangroves! From AED 456.75 A scenic tour of historical sites in Dibba, Oman, this cycling trip is a great way to better understand the history and culture of the Musandam. Starting from our Adventure Centre in Dibba, we'll cycle on paved and dirt roads through plantations and along the coastline. Along the way, we'll visit the restored Dibba fort, grave sites from the Ridda Wars and, spot the ruins of the Queen of Sheeba castle.